There once lived a king who announced to prize the artist who would paint the best painting depicting peace. Many great painters sent the king several of their best art pieces. One of the pictures among the various master pieces was of a calm lake perfectly mirroring peacefully towering snow-capped mountains. Overheard was a blue clear sky with fluffy clouds. The picture was perfect. Most of the people who viewed the pictures of peace from various artist thought that it was the best among all. But when the king announced the winner, everyone was shocked. The picture which won the prize had a mountains too but it was rugged and bare. The sky looked very angry, there were lightning. This did not look peaceful at all. It looked like the artist has mistakenly submitted his painting depicting storm rather than peace. But if anyone looked closely at the painting, he could see a tiny bush growing in the cracks in the rock. In the bush a mother bird had built her next. In the midst of the rush of angry weather, the bird sat on her nest with peace. The peace does not mean to be in a place where there is no noise or trouble. 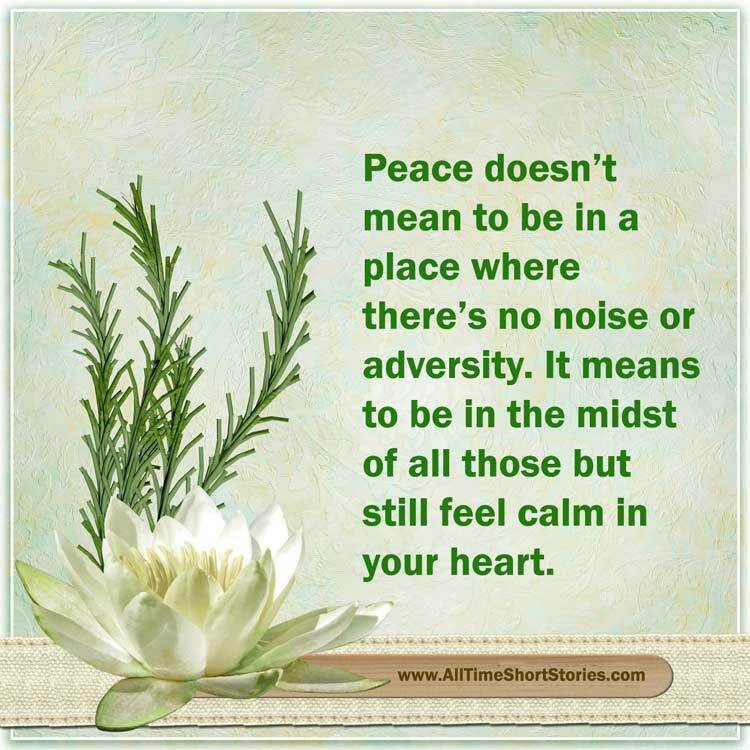 Peace means to be in the midst of all the chaos and still be calm in the heart. The real peace is the state of mind, not the state of the surroundings. The mother bird at her her calm, despite her chaotic surrounding indeed was the best representation for peace.